This is a revised edition of the paper I presented to the American Academy of Religon/Western Regional meeting on 25 Mar '97. I felt the original was no longer fully reflective of my understanding of the Jhanas. This change in my understanding has taken place due to my own practice, teaching jhanas on numerous retreats, talking with other teachers and practitioners (see here and here), and studying the suttas and commentaries (see here and here). All of us are familiar with the eightfold path -- the Buddha's prescription for attaining enlightenment. We have some idea what is meant by right speech, right action, right livelihood and so forth. And we know that these are very important. However, the one step in the path that is often short-changed is the eighth step: "Right Concentration." This paper will seek to explain what right concentration is, how to practice it, and the role it plays in the road to enlightenment. There is the case where a monk -- quite secluded from sensuality, secluded from unskillful (mental) qualities -- enters & remains in the first jhana: rapture & happiness born of seclusion, accompanied by initial & sustained attention [to the object of meditation]. With the stilling of initial & sustained attention, he enters & remains in the second jhana: rapture & happiness born of concentration, unification of awareness free from initial attention & sustained attention -- internal tranquility. Before he became the Buddha, at the beginning of his spiritual quest, Siddhattha Gotma studied with two teachers. The first teacher taught him the seventh Jhanas (and we assume the first 6 as well); the other teacher taught him the eighth Jhana. Both teachers told him they had taught him all there was to learn. But Siddhattha still didn't know what to do about dukkha (unsatisfactoriness, suffering), so he left each of these teachers and wound up doing six years of austerity practices. Those too did not provide the answer to his question and he abandoned those for what has come to be known as the Middle Way. The suttas indicate that on the night of his enlightenment, he sat down under the Bohdi Tree and began his meditation by practicing the Jhanas (e.g. see the Mahasaccaka Sutta - Majjhima Nikaya #36). When his mind was "concentrated, purified, bright, unblemished, rid of imperfection, malleable, wieldy, steady and attained to imperturbability" he direct it to the "true knowledges" that gave rise to his breakthru in consciousness that we call Enlightenment. So we see that the Jhanas are not only at the heart of his teaching, but also were at the heart of his own practice. The Pali word Jhana is best translated as "meditative absorption state." It is the same as the Sanskrit Dhyana, which derives from Dhayati, meaning to think or meditate. You know what an "absorption state" is -- it's when you get so involved in a TV show or video game or mystery novel that you are surprised when the phone rings and brings you back to reality. The Jhanas are eight altered states of consciousness which can arise during periods of strong concentration. The Jhanas are naturally occurring states of mind, but learning how to enter them at will and how to stay in them takes practice. There is very little actual instruction on how to "do" Jhana practice in the suttas. One probable reason for this is that the Jhanas were a well-known practice among serious spiritual seekers 2500 years ago. Just like today, when giving someone directions to your house, you don't include information on how to start the car, shift gears, etc., so it wasn't considered necessary to explain how to enter the Jhanas. Another probable reason is that the Jhanas are best learned in a one-on-one setting with a teacher -- they do not lend themselves to what we call today "book learning." Let us examine each Jhana and how one goes about "doing" them. You must have a certain amount of concentration for the first Jhana to arise. This is called access concentration. Access concentration has sila (morality) as a prerequisite. The description of the first Jhana starts "Secluded from sensuality, secluded from unwholesome states of mind...". If you are not leading a morally upright life, you cannot expect to sit down on a little pillow and find yourself "secluded from sensuality, secluded from unwholesome states of mind." If there is not sufficient sila, there is too much to desire, too much to hate or fear, too much to worry about, etc. We can also deduce that access concentration requires that you be in a physical posture that is both comfortable and alert; otherwise, you will be in a painful posture which will lead to aversion, or you will be too sleepy to meditate. Access concentration can be induced in a number of different ways. There are some forty different methods of meditation mentioned in the suttas, and about thirty of these are suitable for gaining entry to the first Jhana. As described in the suttas, the first Jhana has four factors, and the first two are Vittaka and Vichara. These two words often get translated as something like "thinking and pondering." They do have these meanings in some contexts, but not in the context of the Jhanas. Here they are best translated as "initial and sustained attention to the object of meditation." You keep putting your attention on the meditation object until you are concentrated enough that you can effortlessly leave it on the meditation object. For example, if you have chosen Anapanasati (mindfulness of breathing) as the meditation method, you keep bringing your attention to the breath until you can keep your attention on the breath. How do you know access concentration has been established? The mind is fully with the object of meditation and, if there are any thoughts, they are wispy and in the background; they do not draw you away from the meditation object. There may also be other signs -- which vary for each method. For mindfulness of breathing, the breath becomes very fine, almost undetectable when you have established access concentration. Once access concentration has been established, you now induce the next factor of the first Jhana. This third factor is called piti and is variously translated as delight, euphoria, rapture and ecstasy. By shifting your attention from the meditation object to a pleasant sensation, particularly a pleasant physical sensation, and doing nothing more than not becoming distracted from the pleasant sensation, you will "automatically" enter the first Jhana. The experience is that the pleasant sensation grows in intensity until it explodes into an unmistakable state of ecstasy. This is piti, which is primarily a physical experience. Physical pleasure this intense is accompanied by emotional pleasure, and this emotional pleasure is sukha (joy, happiness), which is the fourth factor of the first Jhana. The commentaries add a fifth factor to the first Jhana -- ekaggata (one-pointedness of mind). Although this factor is occasionally mentioned in the suttas, it only appears in what are considered "late" or "conglomerate" suttas. The understanding of what constitutes the first jhana has definitely undergone an evolution since the days the Buddha walked the earth. The early suttas clearly state that "unification of mind" arrives with the second jhana -- leaving the first jhana as a less stable, less absorbed state than is found in the later commentaries. You quiet your mind with the initial and sustained attention to the meditation object. I suspect that brain wave activity shows a noticeable decrease during access concentration. By shifting your attention to a pleasant sensation, you set up a positive reinforcement feedback loop within your quiet mind. For example, one of the most useful pleasant sensations to focus on is a smile. The act of smiling generates endorphins, which make you feel good, which makes you smile more, which generates more endorphins, etc. The final and most difficult part of entering the first Jhana is to not do anything but observe the pleasure. Any attempt to increase the pleasure, even any thoughts of wanting to increase the pleasure, interrupt the feedback loop and drop you into a less quiet state of mind. But by doing nothing but focusing intently on the pleasure, you are propelled into an unmistakably altered state of consciousness. For more detailed discussion of entering the first jhana, see my paper Instruction for Entering Jhana. The second Jhana also has four factors. The initial (vitakka) and sustained attention (vicara) to the meditation object cease and are replaced by unification of mind (ekodi-bhavam) and inner tranquility (ajjhattam sampasadanam). The rapture (piti) and happiness (sukha) remain but are now more mature and calmer that what is found in the first jhana. They are said to now be born of concentration (from the first jhana) rather than born of seclusion (from the access concentration). You shift from the first to the second Jhana by shifting your attention from the physical pleasure to the emotional pleasure -- from the piti to the sukha. This has the effect of pushing the physical pleasure into the background and also of greatly calming the mind. The first Jhana is a very intense, agitated state; the second Jhana is much more soothing. The emotional state of joy and happiness (sukha) is now in the foreground. The commentaries speak of three factors for the second Jhana: piti, sukha and ekaggata (the one-pointedness of mind). It is true that the suttas mention piti, sukha and ekodi-bhavam (unification of mind - not ekaggata), but they also mention the arising of ajjhattam sampasadanam (the inner tranquility). These latter two replace the immature vitakka and vicara of the first Jhana generating a calmer, more stable second Jhana. The descriptions of the third Jhana mention a number of factors: equanimity, mindfulness, clear awareness, and pleasure. The piti fades away upon entry to the third Jhana; the sukha remains as pleasure, although the experience is more one of contentment than pleasure. The unification of mind and inner tranquility evolve into clear awareness and equanimity & mindfulness. You shift from the second to the third by entirely letting go of the physical pleasure and changing the emotional pleasure from joy to contentment, almost like turning down the volume control on your emotional pleasure. The second Jhana has an upwelling quality to it as the joy seems to flow through you; the third Jhana is much more of a motionless, quiet contentment. The commentaries mention only two factors for the third jhana: sukha and ekaggata. Apparently, equanimity and pleasure are subsumed into the sukha, and mindfulness and clear awareness make up the ekaggata. It seems a stretch to me. The transition to the fourth Jhana from the third takes a bit more effort and bit more letting go than any of the previous transitions. The contentment of the third Jhana is still a positive state of mind. This contentment is refined into a neutral equanimous, quiet, stillness. There is no positive or negative feeling in either mind or body. There is just an all-pervading, deep calmness, with of course, the unified awareness. The commentaries speak of two factors for the fourth Jhana: equanimity and one-pointedness. This is accurate -- the experience is of a deep, neutral calmness (which can certainly be called equanimity) by an unwavering mind. The agitation of the first Jhana has been refined first into a mind unified on happiness, then on still contentment and finally on neutral calmness. The first four Jhanas are called the fine-material Jhanas. Intense pleasure, joy, contentment and stillness are all states we are familiar with in our normal, everyday lives. But the quality and intensity of these factors as experienced in the Jhanas is more sublime than we normally experience, thus they are called the fine-material Jhanas. The next four Jhanas are called the immaterial Jhanas because they are not like anything we normally experience. Each of these Jhanas has two factors -- the first factor serves as the name of the Jhana, the second factor is one-pointedness (although neither ekaggata or ekodi-bhavam is explicitly mentioned in the descriptions of the immaterial jhanas). The fifth Jhana is called "The Base of Infinite Space". Please remember that these are just names for experiences the likes of which we are not familiar with. It just feels like infinite space -- it doesn't necessarily mean we are able to experience all the space in the universe. According to the suttas, you enter the fifth Jhana by "not giving attention to diversity". This isn't much detail, but then there is very little "how to" detail about any of the Jhanas. Many people enter the fifth Jhana by shifting their attention from the primary factor of the previous Jhana to the boundaries of their being. They then start to mentally push these boundaries outward. If you can continue to focus on imagining your boundaries growing ever larger so that you fill the room, the building, the neighborhood, the city, etc., you will eventually experience a sudden shift and find your self in a huge expanse of empty space. The first time entry into "The Base of Infinite Space" is often quite dramatic. You seem to be observing an incredibly large, empty expanse of space. It can feel like walking up to the edge of the Grand Canyon and looking over, but there is no other side and no bottom. The sixth Jhana is called "The Base of Infinite Consciousness". It has been mistaken for achieving oneness with all consciousness. It can be entered from the fifth Jhana by realizing that in order to "gaze" at an infinite spaciousness, you must have an infinite consciousness, and then shifting your attention to that consciousness. This is a fairly subtle shift, but like the transition from each of the Jhanas to the next higher Jhana, there is an increase in concentration. The seventh Jhana is called "The Base of No-thingness". It has been mistaken for Sunyata (Emptiness). It can be entered from the sixth Jhana by shifting your attention from the infinite consciousness to the content of that consciousness. It is not surprising that the content of infinite consciousness is empty since that infinite consciousness was entered from infinite space which has no perception of diversity. The eighth Jhana is called "The Base of Neither Perception nor Non-perception". It is quite difficult to discuss because there is very little to discuss. Perception is a translation of the word sañña which refers to the categorizing, naming function of the mind. Hence in this state there are no characteristics to recognize, yet one can recognize being in a state with no characteristics. It is a very peaceful, restful state and has the ability to recharge a tired mind (which is also a nice side effect of the fourth Jhana). It is entered from the seventh Jhana by letting go of all the outward, infinite expanse and coming to rest in what seems to be a very natural calm quiet place. The mind seems to know a lot more about how to find this space than can be verbalized. From the above discussion, we can more fully understand the Buddha's teaching of sila, samadhi, pañña -- morality, concentration, wisdom. You clean up your act so that when you sit down to meditate, you can fully concentrate. You use the Jhanas to concentrate your mind as strongly as you are able. 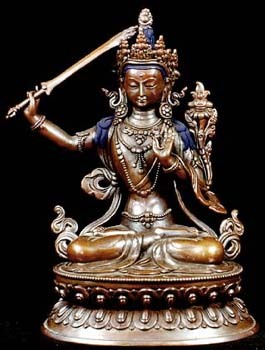 You then begin wielding Manjushri's sword by doing an insight practice that enables you to gain wisdom by seeing things as they really are rather than by seeing things from your usual egocentric perspective. Since the time of the Buddha, attitudes towards the Jhanas have varied greatly. There is strong evidence in the Suttas that quite early on there were at least two schools of thought. One approach emphasized insight practice almost exclusively, feeling that since insight gives rise to the wisdom necessary for enlightenment, this was what was more important. An excellent example of a sutta reflecting this approach is the Sammaditthi Sutta (Majjhima Nikaya #9). Here Sariputta gives a beautiful discourse on Right View. He discussed 16 important topics and ends each topic by saying "When a noble disciple has thus understood [the topic], he uproots the underlying tendency to greed, hatred, the 'I am' conceit and ignorance, and arousing true knowledge he here and now makes an end of suffering." Here enlightenment is achieved solely through insights; the Jhanas are not even mentioned. Another school of thought gave considerable importance to the Jhanas. Those using this approach practiced the Jhanas so deeply that they developed Siddhis (supernormal powers). These Siddhis, such as the divine ear (telepathy), being in two places at once, (bi-location), remembering past lives, etc., may be seen as phenomena in which the person is tapping into the "collective unconscious." This approach to enlightenment can be found in Digha Nikaya Suttas #2 - #12. In each of these suttas, the Buddha first teaches morality and then the Jhanas. From the concentration resulting from the Jhanas, "one inclines and directs the mind," first to insight into body and mind, and then to the attainment of these Siddhis. Enlightenment is attained in exactly the same way as insight and the divine ear. This "formula" appears in nine of these eleven suttas in almost exactly the same way -- something to be expected in an oral tradition -- but which means that we cannot be sure of what was originally in the sutta before the formula was inserted. Insight is mentioned in this method, but many more words are given to the descriptions of these supernormal powers. Here enlightenment is achieved after developing paranormal powers. Perhaps we can assume that enlightenment arises in one who has developed sufficient intimate contact with the collective unconscious that one can no longer conceive of oneself as a separate entity. The Culasaropama Sutta (Majjhima Nikaya #30) in addition to being an excellent teaching on the dangers of spiritual materialism, also refers to the Jhanas. However, it shows signs that suggest the text has been altered. Its beautiful mathematical harmony of the sutta suddenly breaks down in section 12 with a discussion of the Jhanas. The Jhanas are a concentration practice and concentration has already been stated in section 10 to be a lesser state than knowledge and vision. But when the Jhanas are introduced in section 12, they are said to be "higher and more sublime than knowledge and vision." The inclusion of the Jhanas here actually makes the sutta self-contradictory. It also contradicts other pro-Jhana suttas. The formulation of the eight Jhanas is the standard "short" one, (similar to what is found in the Mahasatipatthana Sutta) but with the addition of a last sentence in each of the paragraphs: "This [too] is a state higher and more sublime than knowledge and vision." This sentence directly contradicts the last sentence of section 84 of the Samaññaphala Sutta (Digha Nikaya #2). In the previous paragraph of the Samaññaphala Sutta, the recluse directs the concentrated, pure, bright mind resulting from the fourth Jhana towards knowledge and vision. The understanding gained "is a visible fruit of recluseship more excellent and sublime than the previous ones". Many other suttas show signs of this type of tampering and we are left today with the task of puzzling out the original teaching. The effects of this multi-millennium old debate still affect us today, not only in not knowing what the original suttas looked like, but also in understanding the role of the Jhanas. The Jhanas are sometimes considered a dangerous practice because they are not an insight practice. The primary factor of the first Jhana is piti, and piti is mentioned as a corruption of insight in the commentaries (see, for example, the Visuddhimagga). This has been taken to mean that piti is bad, when all that is meant is that piti should not be mistaken for a non-mundane state. Theravadan Buddhism in the West has primarily come down from the Mahasi Sayadaw tradition in Burma and this tradition is a "dry insight" (non-Jhanic) tradition. Thus the Jhanas are seldom mentioned, let alone taught, in Western Theravadan Buddhist teaching. The Jhanas are also difficult to teach. Not everyone has a temperament suited to concentration practice. Even for those who find concentration easy, the Jhanas require a long silent retreat setting for learning. Far from being "secluded from unwholesome states of mind," people who wish to learn the Jhanas are immediately thrust INTO the state of desiring something. Finally, as mentioned above, the Jhanas do not lend themselves to "book learning"; you really need one-on-one, immediate feedback from a teacher in order to aim your mind in the correct direction. The Jhanas are natural states on mind, but the lives we lead here in the 21st century are so filled that it is difficult to find the quiet, natural mind. The Jhanas are states of concentration. How to do them was common knowledge at the time of the Buddha. He practiced them, and it is clear from the suttas that they comprise right concentration. We are left with the task of fitting the Jhanas into our present spiritual practices. Perhaps between the extremes of ignoring them completely and practicing them to excess, lies the middle way of using them as a tool to sharpen the mind for insight practice. This work may be freely distributed, as a gift of Dhamma. I wish to thank Sarah Lewis for encouraging me to write this paper in the first place and for all her editorial help. Metta! I wish to thank Minia Roth for encouraging me to revise this paper and for all her editorial help. Metta!